The Louise Vitry house was built in 1855 for Free Woman of Color, Louise Arsene Vitry by her consort, Achille Barthelmy Courcelle, a white New Orleanian. Louise Vitry (1818? – 1867) was born in Louisiana to parents who came to New Orleans fleeing the Haitian Slave Revolts of the 1790’s. Mr. Courcelle was an early New Orleans builder who worked with the famous Louisiana Architect, Henry Howard on such houses as 926 Esplanade. There are many details in the 926 Esplanade House that are similar to the Louise Vitry House including the ironwork, staircase, and triple-paneled window casings. The couple, who were not allowed to marry because of miscegenation laws, lived together some 20 years and had 5 children, Philomene Clement Achille (b.1837), Lumena (b. 1839), Rosella (b. 1841), Laure (b. 1843), and Marianne Emilie (b. 1846). In 1857, there was a bank panic, and Courcelle, who was heavily in debt, sued Louise Arsene Vitry for possession of the house. 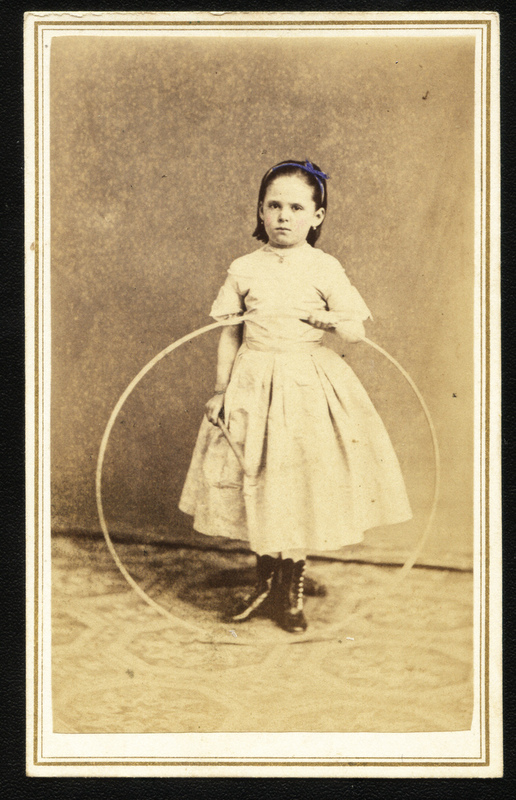 In 1858, Courcelle won his case but Louise Arsene appealed to the Louisiana State Supreme Court, which subsequently ruled in her favor. The Supreme Court document, hand written in both French and English, is over 200 pages in length and had a “Notarial Archives” type drawing attached to it showing how the house looked at the time. This drawing has disappeared from the archive in the last 30 years. The original lot of the house spanned an entire block in depth from Dumaine Street to St. Phillip Street. It is also noted in the Supreme Court Case that Louise Vitry was allowed to keep their 7 slaves. 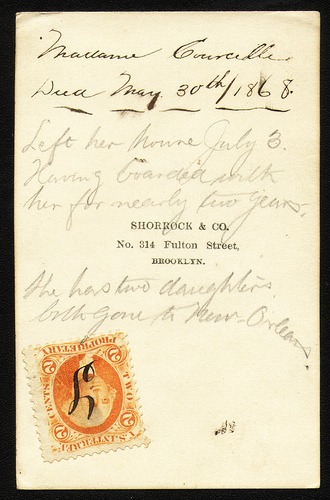 Louise apparently left the city of New Orleans sometime during or soon after the civil war and died in Brooklyn, NY in 1868. 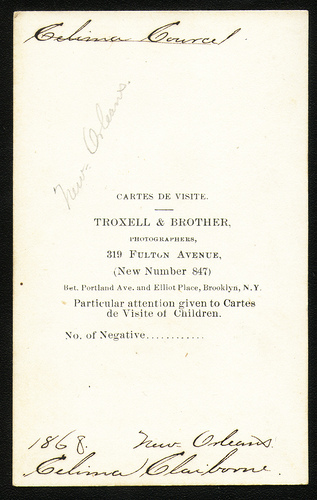 The carte-de-visite images that we have of Louise Vitry and her grand daughter were taken in Brooklyn sometime between 1864-1868. AN UPDATE: Louise Vitry Courcelle’s 3 X grand daughter was gracious enough to hunt down and purchase the original cartes-de-visite of Louise and her grand daughter Celine and send them back to Maison Vitry. It was a long roller coaster journey to get the photos back. I was very excited to hear the news and even more excited to receive the photos. Upon opening the photos, I turned over Louise’s card and read the caption: Mme Courcelle died on May 30, 1868. It suddenly dawned on me that today was May 30, 2013. The photos arrived here exactly 145 years to the day Louise died. It was an emotional moment. The house is an American Style side-hall town house with many original features including it’s original painted plaster frescos, mahogany staircase, ceiling medallion and some surviving marbleizing and wood graining. It is interesting to note that this very Creole family lived in a house that was the latest “American” style and not the more conservative Creole style. When the house went up for sale in 1882, there was a full column newspaper description of the home, again written in both French and English. It describes “An Elegant Family Dwelling” and all of the outbuildings which included a kitchen, 4 water cisterns, a green house, and a wine cellar. It also described how the gardens were laid out and the plant material it contained. The inside of the house is outlined in detail and had 2 indoor bathrooms. Louise is my 3xgreat grandmother and I am thrilled to see her home being brought back to its former granduer! The current owners have done a yeoman’s job on a house that once faced the wrecking ball. my siblings and I are trying to find the 2X or 3X granchildren of Achille and Louise …. do you have any information of their whereabouts? Hi there, Jeri. Jacques here, I help moderate the site. Please send an email to louise@maisonvitry.com, and Will would be glad to help you out! I am curious to know if Louise was African ,or Spanish? Can anyone tell me? Hi Ruth. I am a descendant of Louise Vitry, and I am currently organizing a genealogy report on the family. Louise was the daughter of Pierre Alexandre Marie “Marquis” Vitry and Marie Louise Beauchamp, natives of Haiti. She is of Haitian descent, which includes African, French, and Spanish ancestry. Her maternal grandmother’s name is Catherine Miguens. Miguens is a Spanish name. Louise was born in New Orleans and baptized at the St. Louis Cathedral. Our Great Father’s name was Achille Courcelle. They weren’t allowed to marry, because she was a woman of color. My Great Grand Father lived with Louise Vitry and had 5 children with her. My family is also doing a genealogy search. 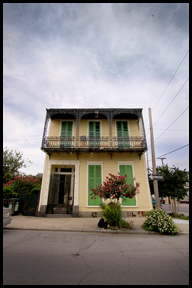 we searched some things and saw the Vitry house in New Orleans. Maybe we can all get together one day and compare notes. Hello Robert – I am one of the great great granddaughter’s.. I have heard from Will, and Rose, and Pamela. I am so happy to get to know everyone! 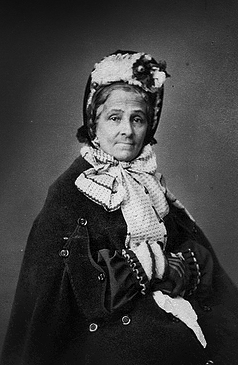 Louise A. Vitry’s Parents were Pierre Vitry and Maria Luisa Beaucamp both from Port Au Prince, Haiti, who had 5 children: Louise A. Vitry (1811 to 1868), Clemente L. Vitry (1815), Augustin Vitry (1816), Josephine Vitre (May 12, 1818), and Angele Vitre (1821). I love it! I am in France now researching my ancestor Antoine Simian & Madam Pauline Simian, their beautiful home us now the courthouse in Valreas, France! Antoine formed a Religious Union with a Creole women, Marie who became one of the most wealthiest Creole women in the South, she is listed in 2 books, she was lucky enough to inherit all of his property, businesses ! Slaves! !